From nature to nature. A fact we respect. There is no denying our dependence on nature. That is why Hooymans Compost B.V. regards the way it deals with nature and environment as important. Everyone can notice the influence of nature, and it’s no different in our business. The process as it unfolds in nature produces certain smells, which can be experienced as unpleasant by our environment. Hooymans Compost B.V. has spent years of research on finding a way to solve this problem. This solution was found in the form of a biofilter. A layer of various natural materials, including parts of bark, is used as a biological filter that naturally absorbs the smells. The biofilter occupies a space of no less than 1,800 m2 and produces an odour-free environment for the surrounding residents. 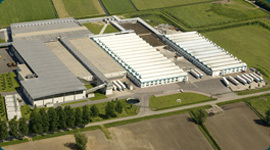 In this way Hooymans Compost B.V. works to constantly improve the operating process and to mitigate its effects on the environment.